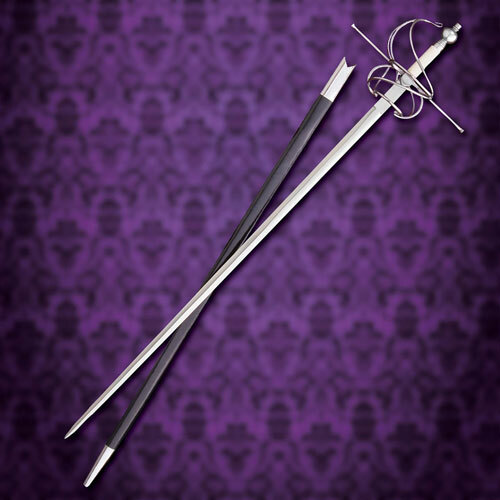 Swept Hilt Rapier Swords for sale are 43 ¾ inches in all and weigh 2 pounds 2 ounces. This Swept Hilt Rapier Sword is inspired by real fencing sabres that were popular in the 16th and 17th centuries. This version is hand forged of 1055 high carbon steel and features a functional 38 ½ inch blade with a diamond cross section. These swords feature an ornate pommel and an all steel guard. The 3 ¾ inch grip is made with real polished bone. They include a real leather scabbard that is accented with a steel throat and tip. Buy the Swept Hilt Rapier Swords for $239.99.